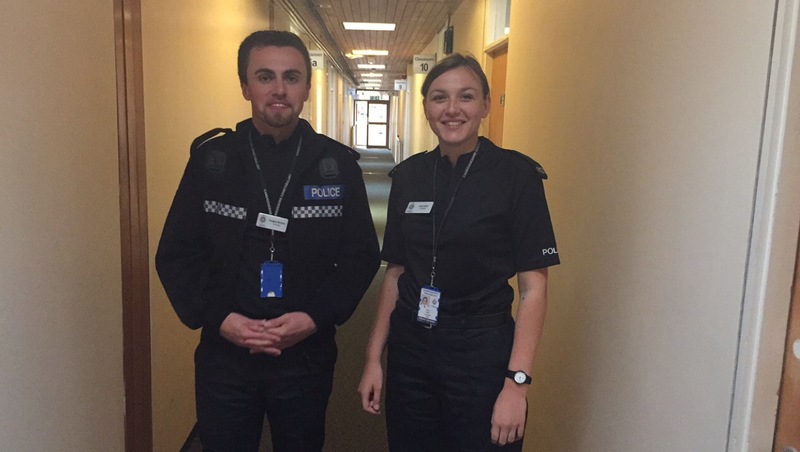 A big hello from probationer police constables Jess Smith and Doug McColm! We are two new officers who will be joining the South Cambridgeshire district by the end of this year. Jess has just finished university in Cambridge having studied Criminology and in that time, she was a Special Constable for two years in Cambridge City. Doug was a Special Sergeant at Huntingdon Station for six years and worked as a lorry driver in central Cambridge. We are both very excited to be joining Cambridgeshire Constabulary. We will be giving a blog update every week to inform you all of our progress and how we are finding out training and when we are on division. We are two of a group of 26 other constables currently training, and we will be giving you an insight into the police training process and what is required for new police officers to successfully pass out of training. Tuesday – After months of interviews, assessments and tests we at last arrived at the training centre on Tuesday morning – in fact I was so keen I was there an hour early! Our first day was all about getting to know each other; there are 26 of us, and I am one of eight girls. We range in age and come from all different backgrounds. We also met our three trainers, who have a wealth of experience and I’m sure we’ll all get to know each other well over the next four months. The big moment came when we collected our kit, which we had been fitted for back in August. Some of us had worn the uniform before as Specials or PCSOs, and for others, it was a completely new experience. Tonight I am going to tackle ironing my uniform and polishing my boots for our swearing in ceremony on Thursday! Wednesday – Our first tasks working in our groups, preparing presentations to each other on a range of interesting subjects. In the afternoon, we also had an interesting chat from the Police Federation Representative about our careers and support. Thursday – A big day when we were officially sworn in as police officers! We all were excited for our attestation ceremony. A magistrate and the Acting Chief Constable were there as we swore our oaths, as well as representatives from all of the different divisions we would be going to after our 16 weeks of training. It was quite nerve racking, but it was good fun and it went without a hitch! What a way to celebrate my 22nd birthday! Tuesday- Today was the day! After a long and stringent recruitment process, 26 nervous new faces arrived at Cambridgeshire’s police training school bright and early! The first day consisted of getting to know our fellow colleagues and trainers, whilst completing general administration work throughout the day. We also received our shiny new kit- Time to get the boot polish and iron out! Wednesday- Due to the large size of our intake, our group of 26 has been split into two groups, myself in group one and Jess in group 2. Throughout our training period we each may be doing completely different tasks compared to the other group. Today we were given three presentations to prepare for which we will eventually present to the group. Our group had our basic IT training in the morning to allow us to access the force computer systems. Thursday- For my group it was the fitness test in the morning! We arrived at HQ gym bright and early to complete our mandatory fitness test, consisting of a bleep test shuttle run, push and pull machine exercise and a gym lesson afterwards (Yes, I passed!). The afternoon was a proud moment when we all were attested as Police Constables, which involved taking the oath in front of a Magistrate and the Acting Chief Constable. What a day! Friday- Friday was the first big classroom day, learning about our pocket notebooks and summons and warrants. Roll on next week!